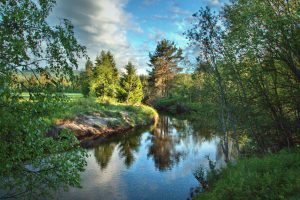 The Rena River is considered by many to be one of the most attractive rivers in Norway. 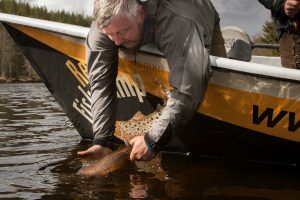 The long gliding stretches and an abundant insect life make it a perfect habitat for big grayling, trout and whitefish. The river i large with a steady flow with good number of large grayling and trout. You will also find species as white fish, and in the lower part also pike. 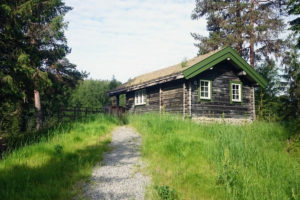 There is a fly fishing only zone between Storsjødammen and Rødhammeren of approximately 5 km. 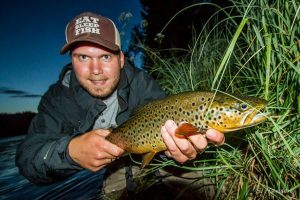 The long quiet stretches of the river create perfect dry fly fishing for trophy fish, brown trout up to 7 kg have been caught. 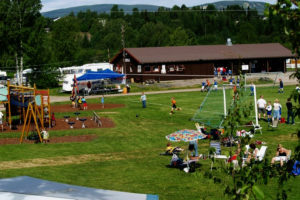 “Søndre Rena” starts at the outlet of Storsjøen and goes all the way down to the junction with Glomma about 30 km future south. 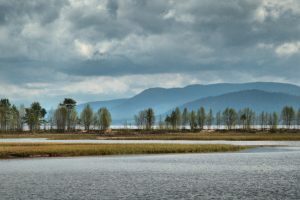 There is a power dam about 6 km upstream from where the river joins Glomma, upstream of the power dam you will find the 5 km long artificial Lake Løpsjøen. 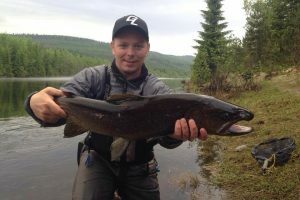 Fishing season from 1st of May until 31st of October, trout are protected from 15th of September. 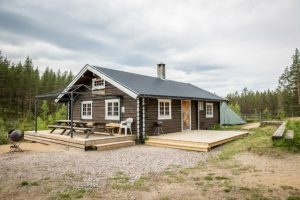 Løpsjøen up to Holmbo are an exception: here you can fish all year, but trout are protected from of September 15th to april 30th. 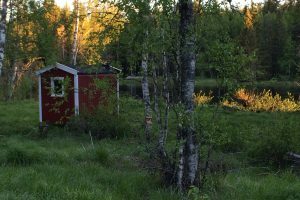 Existing protection zone established by the County Governor of Hedmark downstream Løpdammen are expanded. The protection zone starts downstream of the power dam and runs all the way down to the marker/sign at the tail end of the pool. 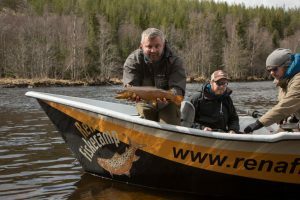 “Søndre Rena” upstreams of Løpet power dam: No catching regulation on stocked trout (fat fin removed). 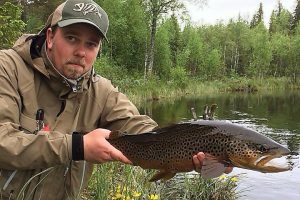 Wild brown trout, 1 fish per angler per 24 hour period, all trout over 40 cm have to be released. Grayling, 1 grayling per angler per 24-hour period, all grayling over 40 cm have to be released. 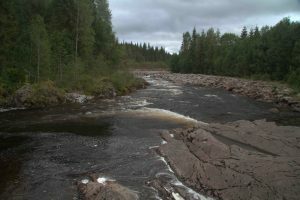 “Søndre Rena” downstream of Løpet power dam: No catching regulation on stocked trout (fat fin removed). 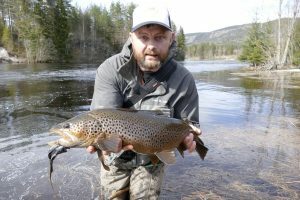 Wild brown trout, 3 fish per angler per 24 hour period, all trout over 40 cm have to be released. Grayling, 3 grayling per angler per 24-hour period, all grayling over 40 cm have to be released. Anglers must bring a measure tape, if in doubt caught fish must be released. 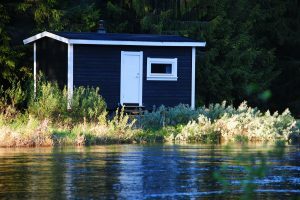 The fishing license is personal and only valid with a personal Id. All children under the age of 16 years fish for free. Violations of the rules might result in prosecution. Show respect for farmed fields, do not walk across but walk on the edges. Respect local residents and only use marked parking places (see maps.). Remember that the atmosphere on and around the river is our common responsibility. 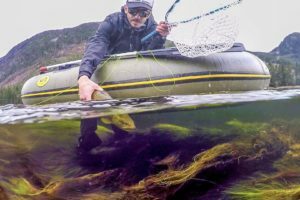 Respect other anglers and bring your garbage back with you, don’t leave it in nature.